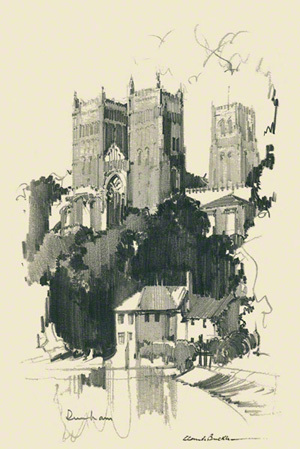 Claude Buckle's very fine pencil sketch of Durham Cathedral taken from the popular view opposite the Cornmill. The Cathedral Church of Christ, Blessed Mary the Virgin and St Cuthbert of Durham (usually known as Durham Cathedral) is a cathedral in the city of Durham. The cathedral is regarded as one of the finest examples of Norman architecture and has been designated a UNESCO World Heritage Site along with nearby Durham Castle, which faces it across Palace Green. The view is from across the River Wear opposite the Cornmill now a museum. Created in 1947.